This page will examine elephant guns for analyzing sudoku puzzles. This style of analysis was introduced to me by Andrei Zelevinsky. While AIC or forbidding chains handle bilocation and bivalue terms with sufficient efficiency, they fail to adequately handle multiple strong/weak inferences emanating from a single node. There are many ways to address this problem. What follows is one possible manner. When I was first introduced to these concepts, I thought they were excellent proving tools. However, I found them unwieldy to use as tools for finding possible sudoku eliminations or patterns. Since then, I have changed my mind. The primary inspiration, in my opinion, is that sudoku can be reduced to merely counting truths, and figuring out where they must lie. This is very obvious in the first matrix type (pigeonhole). It is less obvious in the other matrix types. Unused matrix cells - blank cells - are considered false. The first column, the result column, is proven to contain at least one truth - thus a derived strong inference set. Caveat: A weak inference set cannot usually include the same possible Boolean argument twice. This is because Boolean A does not normally forbid itself. Thus, in n-1 columns, there exists at most n-1 truths. One can also employ a proof by contradiction. Also an easy inductive proof is possible. Symmetric Pigeonhole matrices easily handle proving relationships such as swordfish, naked triples, Sue de Coq, Hub Spoke Rims, etc. The first step that I took in the Easter Monster puzzle can also be written as such a matrix. The advantage, in the case of symmetric pigeonhole matrices, is that little regard needs to be applied to figuring out how to build one. So, to build a matrix to prove that Easter Monster step, one need only start listing the strong sets considered. One need then only place the row items in a column such that they meet the weak inference requirement. In the example below, I have added a description column to the far right to describe the nature of the strong inference set considered on each row. I have also added a description row at the bottom to describe the nature of the weak inference set considered on each column. The matrix above proves each column is a strong inference set, justifying the eliminations argued for in the Opening Volley on the Easter Monster. With asymmetric pigeonhole matrices, the first column is less restricted. This, in my opinion, makes them a bit harder to locate. However, every bilocation/bivalue AIC can be written as a pigeonhole matrix. However, that is not the limit of their utility. Note there is a subtle difference here from the pigeonhole matrix. Note that for a 1x1 triangular matrix, the first row and the first column form an identity, thus the inductive assumption is trivially true. Assume the inductive assumption is valid for all cases such that m<n, n>1. Suppose the entry at row n, column 1 is true. Then clearly the first column contains a truth. Suppose the entry at row n, column 1 is false. Then some entry, call it j, j>1, at row n column j must be true. Therefor, the entry at row j-1, column j is false. This is, by definition, the top entry in that column. Consider now the submatrix formed by rows 1 through j-1 and columns 1 through j-1. It is a triangular matrix. Therefor, some item in column 1 must be true. Triangular matrices are useful to tackle situations which require nets. The downside is that one needs to start with a bivalue/bilocation type of argument. However, one can continue from that argument and add strong inferences at will, as long as one only adds one extra undetermined item each time. Some where one then needs to close the loop. This is a bit arbitrary, though. One can always close the loop. However, there is no gaurantee that closing the loop will yield anything valuable. I encountered the situation above while wrestling with the Easter Monster. Candidate 1 is limited to the highlit cells. The cells that are highlit blueish represent the four strong inference sets that I considered. Typically, when I color, I break out sub-groups and analyze their interactions. 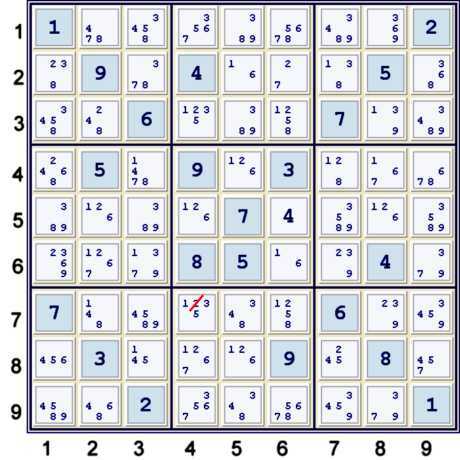 One could say all sudoku eliminations stem from a similar reduction in puzzle strong inferences considered. break out a sub-chain - contained above by the brackets . Using the Triangular Matrix thought process has proven valuable (for me at least) in finding such eliminations. Note that one can expand the idea to use triangular matrices to find new strong inference sets, even if the sets do not immediately forbid anything. Note there is a no difference here from the triangular matrix. If there are two top entries in a single row, then they each form a block. Each of these blocks must form triangular matrices. By defintion, block triangular matrices reduce to a strong inference set of triangular matrices. Block triangular matrices are helpful in pushing deductions through unavoidable multi-value or multi-location strong inference sets. In general, they are ugly. In practice, they are usually avoidable. However, in some cases they are the quickest way to a deduction. Below is another example from the Easter Monster. At this point, I am not certain if the following step will be in my solution. Nevertheless, it is one of the deductions sitting on my desktop. The deduction centers upon (1=6)r6c6. The logic plays out: (1)r7c4=[(2)r7c8=(2)r7c6] => r7c4≠2. The path to get there starts: (1)r7c4=[(2)r7c8=(2-1)r5c8=[(1)r7c6=(1)r7c2-(1)r5c2=(1)r5c4]-(1=6)r6c6-.....=(2)r7c6]. The entire path is very messy to place into AIC language. However, it is fairly straighforward as a Block Triangular Matrix (BTM). Once again, the first column will be a strong inference set descriptor. Note also that the path uses a proven strong set and a proven weak set. Specifically, the following two proven (previously on the opening page of the Easter Monster) relationships are used: (1)r7c2=(6)r9c2 and (1)r45c8-(6)r45c8. The first of these serves to shorten the deduction a bit. The weak relationship is not really required, but it is a more accurate representation of how I found the elimination. Note that (1)r6c6 reverts cleanly back to matrix column 1 with a 3x3 Triangular matrix, whilst (6) r6c6 leaves in its wake a 9x9 Triangular matrix. They both overlap with the first matrix row. The primary keys to finding the deduction are the first four matrix rows and the last matrix row. The rest of the deduction is relatively easy (for that puzzle, I mean!) once one sees those parts. By mixing matrix types, one can write steps such as the Almost Remote Pair step of my solution to Unsolvable 13 with relative ease. The real value lies in opening up the possibility matrix for unconventional attack. This same deduction can be easily written into a Mixed Block Matrix. The bold items represent a 6x6 pigeonhole matrix. 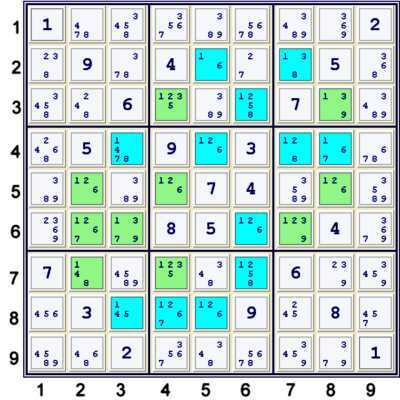 The result column of this 6x6 pigeonhole matrix is :[(1)r8c3=(6)r8c1]=(2)r5c8. The other items are part of a general Triangular matrix. The final result, (1=6)r8B7 should be rendered more transparent. and I know that I have found something. This page is intended to also be a supplement for the eventually forthcoming solution to the fabled Easter Monster puzzle. Very very good work STEVE... ! But I think how many people come here can understand ...? How about EUREKA Site now...? 'tis a bit much, some of this stuff. But, to slay a beast one must sometimes wield weaponry that takes some training, not to mention straining. Eureka is down for a bit, but I think it is coming back up soon. You may have to eliminate spaces if you paste that into the address bar of your browser.